My name is Janine Mallon; travel broker, business owner/operator and seasoned traveller. With over 15 years’ experience in the travel industry, I have the knowledge and skills to help you design your dream holiday. My team members include Travel Consultant Jenny Galliven who comes with over 20 years’ experience and Office Manager Lauren Macshane. A love of languages cultivated through my teenage years, stoked a desire to travel and experience the world and I embarked on my first overseas trip, a student exchange to Germany at the age of 16. This adventure strengthened my desire for future travel and my journeys since have taken me all over the Globe! 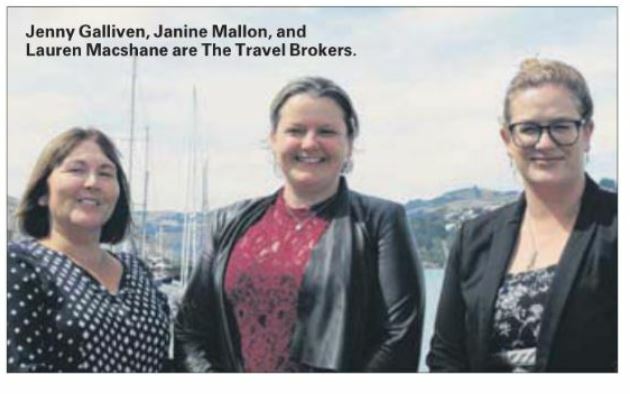 After graduating from the University of Otago with a Double Bachelor’s Degree in Languages and Tourism Management, I began my career in the travel industry. During my career I have opened two travel agencies and managed three teams for various companies. In 2010 I took on a bigger challenge and formed my own company – Tasty Tours. What started as a small business offering day tours around Dunedin and Otago has now grown to combine my greatest passions: Travel, food and wine. Shortly the new Tasty Tours website will launch which will showcase culinary and beverage travel experiences around the world. From the wine valleys of South Australia to the incredible wildlife of Southern Africa and the Galapagos Islands, my travel experiences will offer you unique insights, tailored to suit your travel needs. Every trip has a different purpose, perhaps something special you want to see or experience, and each adventure you embark on should be filled with so many memorable moments, you cannot pin point just one particular highlight. My team is here to help you create those travel experiences unique and special to you and filled with memorable moments and highlights. We want to make your travel dreams a reality! We believe that you have the right to plan your travel uninterrupted and where and when you want to. Whether that means meeting with one of the team in a café, at our office, in your home or simply communicating via phone and email, we will be happy to adapt to suit you. We love helping you to arrange your travel travel and helping to make your dreams come alive. By accessing great deals through any reputable supplier, we can assist with anything from flights and stopovers to cruises, tours, accommodation, trains and rental cars, sightseeing, show tickets and of course packaging everything together to design your unique holiday. We will ensure that we find the best deals suited to you so let us do the searching and take away the hassle of dealing with Airpoints, arranging visas, insurance and negotiating deals with airlines and suppliers. As a member of Helloworld, we have access to a fantastic range of deals which we can customise to design your ideal trip. Please contact us with your travel plans and ideas and we will be more than happy to assist you. We look forward to meeting you and working together to create an unforgettable travel experience you will cherish forever. Your team Janine, Jenny and Lauren - for the unique holiday you deserve.